Hey folks, in Chennai there are 2 hot things happening. 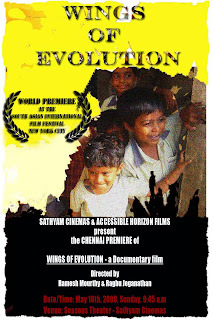 One of course, Chennai itself, with its scorching heat and the Other is our Exclusive Screening of 'Wings of Evolution' on May 18th, 2008, at 9:45 a.m at the Seasons Theater of Sathyam Cinemas, one of the biggest multiplexes in South India. Currently, preparations are being made with ticketing, posters etc. We'll have a post-screening panel discussion , the details of which have not been finalized. Will post an update soon. Folks in Chennai, rsvp to attend. Till then, keep beating the heat.